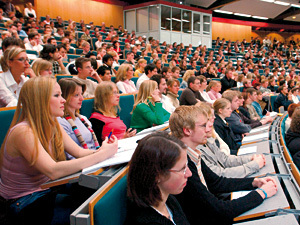 The University of Paderborn’s Department of Computer Science is one of the best university institutes in Germany, and is ranked as excellent among international universities. We offer internationally recognized academic programs. The four-semester Master’s program builds on the fundamental knowledge acquired in the Bachelor’s program. The Master’s program gives you the opportunity to specialize your knowledge in one of the Computer Science sections mentioned above. One of the special challenges in the Master’s program is the 2-semester project group, where students approach a relevant research-based topic together as a team. The study program is completed by the Master’s Thesis and oral examination, which are the final prerequisites for acquiring the Master of Science (M.Sc.) degree. As of winter semester 2009/10, a part-time variation of the study program has also been introduced, which lets students finish a Master’s degree after 8 semesters. This opens up new opportunities for students to acquire a university degree even if they have to work or support a family at the same time. The Department of Computer Science also offers graduates of the Master's program the opportunity to participate in a PhD program. More information can be found on page: Students > Degree Program > PhD Program.